Bedazzling Spotlight for Vidya Balan in the year ahead, foretells Ganesha. in 2005, winning the Filmfare Best Debut award for her performance. for this role in Paa. which won her the Filmfare Critics Award for Best Actress. Picture â released this week. It portrays her as the South Indian femme fatale, Silk Smitha. Mars is transiting over retrograde Saturn in her Natal chart. is transiting over Natal Mercury. Vidya has retrograde Jupiter, it will work in her favour. 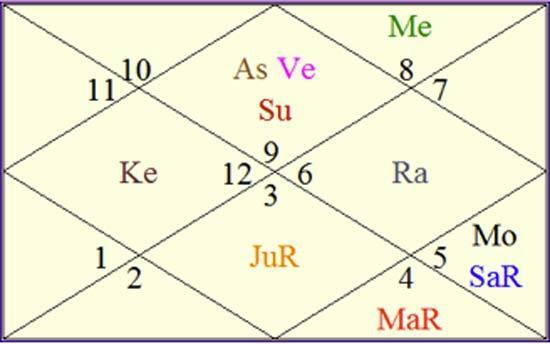 Saturn aspects Natal Venus and Sun. beginning of an important couple of months for her. take on some brilliant movies, but the second half looks average. will make selective but impactful appearances in 2012.
may take on another offbeat movie in the next year, feels Ganesha.